The word ‘rib’ derives from animals’ ribs. In this structure needle heads are not facing directly each other. 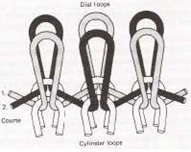 Rib fabrics are composed of loops formed in opposite direction. Various types rib construction are there but common structure are 1×1, 2×2 and above 2×2 construction like 3×3, 4×4, 5×5 fancy rib but 6×6 has special name like Derby rib. Appearance: Both sides are same in appearance. Semicircle loops can be observed in between V shape loops. Edge curling: This fabric does not curl at the edges. It is a balance fabric because of having wales in both directions. The reason is both T/F and T/B bed are active, so tension is uniform on both sides. Dimensional stability: Dimensional stability is good. Unraveled: We can unravel the structure from the end section only (because it forms from double bed). Elasticity: Elasticity can be observed well in widthwise direction. Laddering: Laddering can be repaired in flat bed knitting but not in circular knitting. Density: Density is heavier than single jersey because loops catch at both sides. Bottoms, collar, cuff, hem and for also for full dress. Especially lightweight for undergarments because elasticity is good. If the plain stitches are one behind the other the fabric/ structure is known double jersey. 1. Appearance: Both sides are same in appearance. Both technical front and technical back has V shape stitch/ jersey stitch. 2. Edge curling: This fabric also does not curl at the edges. Reason is that it is more balanced fabric because all needles are active on both sides (T/F and T/B bed). So tension is uniform on both sides. 3. Dimensional stability: Dimensional stability is very good. 4. Unraveled: We can unrope the structure from the end section only (because it forms from double bed). 5. Elasticity: In comparison to other knit fabric; (especially rib) elasticity is poor. Laddering: Laddering can not be repaired in both flat bed knitting and circular knitting. Because both side needles are active at opposite direction. Density: In comparison to other knit fabric; density is heavier. Normally for heavy knitwear Vast because it is fitted. Light knitted is preferred for sportswear (sports T-shirt) because it absorbs sweat well and dimensional stability is good. For ladies skirt. And also for tube fabric to make pocket. T/F has V shape stitch and T/B has semi circle stitch. Semicircle loops can be observed in between V shape loops at both sides. Edge curling does not occur. Dimensional stability is comparatively poor. Can be unroped the yarn from the both end. Can be unroped the yarn from only the end section. Almost equal elasticity both in lengthwise and widthwise direction. Elasticity can be observed well in widthwise direction. Manufacturing by using only T/F needle bed. Manufacturing by using both T/F and T/B needle bed. Density is lighter than Rib knit. Has semicircle loops in between V shape stitches at both sides. Do not have semicircle loops; only V shape stitches at both sides. Density is lighter than double jersey. Density is heavier than Rib. Dimensional stability is better than rib. All needles are not active of both beds. All needles are active of both beds. Both side same in appearance. Can be unraveled the yarn from only the end section. Both are double bedded structure. Manufacturing by using both T/F and T/B needle bed. Made by two set of needle; i.e. dial needle and cylinder needle. Both T/F and T/B has V shape stitch. Dimensional stability is very good. Can be unroped the yarn from the end section only. Elasticity is better than double jersey. Density is heavier than single jersey.